The Bermuda Zoological Society will be hosting a lecture entitled “Reflection on a Half Century of Sea Turtle Conservation: The Roots of the Bermuda Turtle Project” on Thursday, April 26th. The event poster says, “David Godfrey is Executive Director of the Sea Turtle Conservancy [STC], the world’s oldest and most accomplished sea turtle research and conservation group and partner of the Bermuda Turtle Project. “A passionate guardian of the environment, David is travelling to Bermuda to share the story of our beginnings over fifty years ago and the pioneering work of acclaimed ecologist and sea turtle expert Dr. Archie Carr. “This lecture will share some of the very first sea turtle video footage; inspire your appreciation of these mysterious animals; celebrate a half century of success in protecting sea turtles and acknowledge the challenges these species still face. 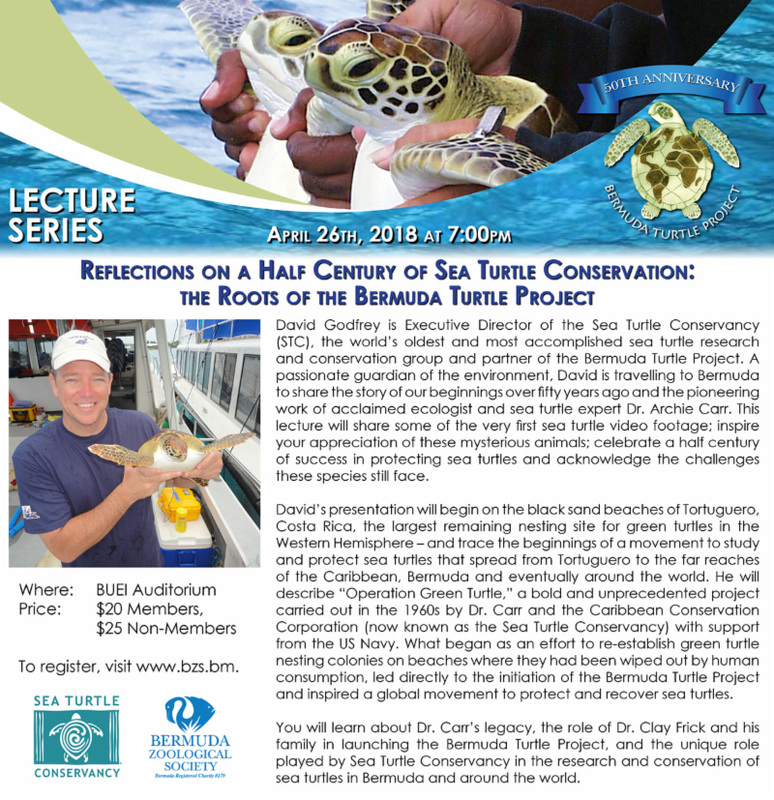 “David’s presentation will begin on the black sand beaches of Tortuguero, Costa Rica, the largest remaining nesting site for green turtles in the Western Hemisphere – and trace the beginnings of a movement to study and protect sea turtles that spread from Tortuguero to the far reaches of the Caribbean, Bermuda and eventually around the world. “He will describe ‘Operation Green Turtle,’ a bold and unprecedented project carried out in the 1960s by Dr. Carr and the Caribbean Conservation Corporation [now known as the Sea Turtle Conservancy] with support from the US Navy. “What began as an effort to re-establish green turtle nesting colonies on beaches where they had been wiped out by human consumption, led directly to the initiation of the Bermuda Turtle Project and inspired a global movement to protect and recover sea turtles.